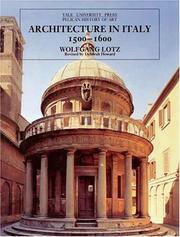 Moving between the various centres of architectural activity throughout Italy, Wolfgang Lotz discusses with authority the work of such well-known architects as Bramante, Giulio Romano, Michelangelo and Palladio. He focuses on the different schemes for St Peter’s in Rome, the projects connected with the church of S. Lorenzo in Florence and the churches and villas designed by Palladio in and around Venice. And yet Lotz also goes beyond the more familiar locations, architects and buildings to conquer less well-known territories, exploring Piedmont and Vitozzi and ending with a study of bizzarrie. Lotz’s distinguished and highly readable text is now reissued accompanied by a wide range of beautiful illustrations and a critical introduction and updated bibliography by Deborah Howard. Dr Howard assesses Lotz’s standing as an architectural historian, and surveys the developments in the discipline and the new material published since the first edition.